Inspired by the classic style of the Anasazi, Maya and Aztec Pre-Columbian cultures, the artwork is infused with a modern sensibility and stands as a metaphor for the relationship between nature, society and the sacred. 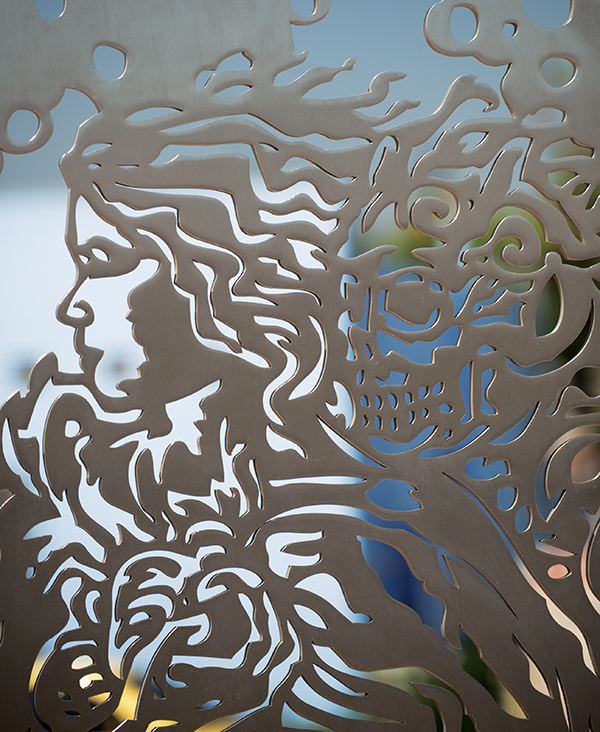 The artist created 16 stainless steel cut panels in the style of “papel picado” (cut paper) along both sides of the station area. 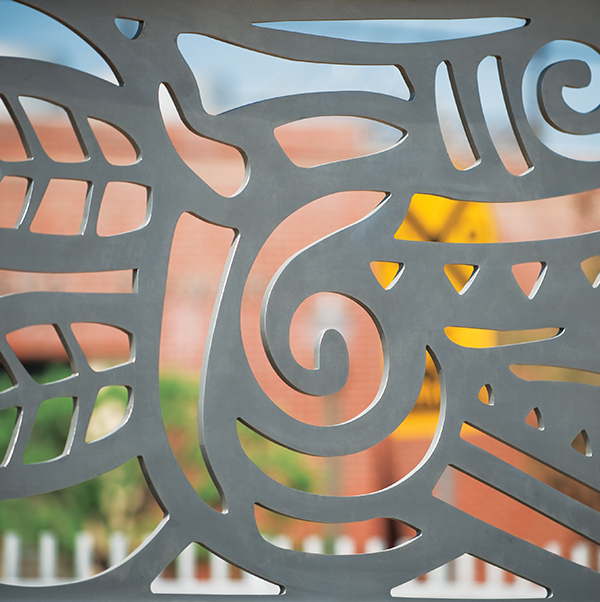 The sculptures pay homage to “family” and “history.” Stylized large scale heads of Quetzalcoatl, the plumed serpent Mesoamerican deity mark the generations past and present and are located within the landscaped areas at both ends of the station platform. PAUL BOTELLO was born and raised in East Los Angeles. He earned a BA and an MFA from Cal State University, Los Angeles. He teaches art in the LAUSD school system and at Claremont College. In 1994 he traveled to Berlin, Germany where he collaborated on a giant mural titled “Global Chessboard.” Other recently completed murals include “Citizens of the World” at Esperanza School, and “In Unison” at the Maravilla Housing Facility. He also completed a large-scale mural on the Metro Gold Line construction fence that was located at First Street and Soto. Portions of the mural can now be found at the Pueblo del Sol Community Center in East Los Angeles. Botello lives and works in East Los Angeles, and exhibits his work in Los Angeles and abroad.